It’s not unusual for peoples names to change, for someone to switch jobs or phone numbers, or even for a company to change their name or information. It’s frustrating to wander into the Contacts app on the iPhone to discover a ton of entries for a single person or entity to cover each of those changes, so when you find your Contacts getting overrun with duplicates or multiple entries for a single person, take the time to clean them up, merge the contacts, and eliminate the duplicates. The easiest way to merge existing contacts into a single contact is to use the Contacts app in Mac OS X. Because Contacts syncs through iCloud (or manually through iTunes, if you’d prefer that approach), changes and merges made on the Mac will instantly transfer back to the iPhone, where the two (or more) contacts will be merged into one. The only limitation, other than having a Mac of course, is that both the Mac and the iPhone be using the same iCloud account. Yes, individual contacts are called “Cards”. Unlike the more general Duplicate finder, there is no warning or confirmation, and the contacts are instantly merged into one. I accidentally merged some Contacts, help! Merged a contact or several that you now regret? Maybe you accidentally merged your boss and your mom? No big deal as long as you address it quickly, you can undo any Contact merge just like you can any other task by hitting Command+Z, or by pulling down the Edit menu and selecting “Undo Merge”. OS X maintains a history to the Undo menu as well, so you can repeatedly hit Command+Z inside of Contacts app to undo more than once, or even if the merge you’re trying to undo is several steps back. The undo feature is helpful, but if you’re going to be making a lot of adjustments to Contacts it may be a good idea to back everything up first so you can revert if something goes awry. Assuming you have iCloud configured, the Contacts should automatically back themselves up, but you can also do it yourself or initiate a manual backup. If contacts are found to be duplicates, choose “Merge” to combine them into one. 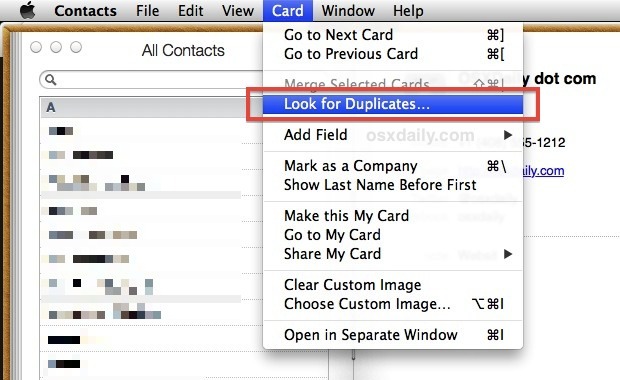 The “Look for Duplicate” feature is fairly effective, but because it focuses on contacts with the same name only, it won’t find other occurrences where a name has changed, or a place of business has changed. In that case, you’ll want to manually combine the contacts yourself using the first method outlined above. If you don’t see the changes within a few minutes and don’t want to wait, you can always sync manually through iTunes as well. Merging contacts is not always as simple as you have suggested. There are 150 results on Apple’s support search on this subject. Merged contacts are never actually merged, thats why you can undo them. As a result, iCloud can return multiply entries to your OS and iOS devises. This is especially so if your contacts (or part of your contacts ) are stored “on my mac” as well as “on iCloud”. Unchecking and rechecking syncing in settings can make a bad situation even worse. When you uncheck contact syncing, your are asked if you want to keep a copy of your contacts “on your mac”. If you say no, you could loose all your contacts when iCloud syncs. I learned this lesson the hard way, and after Apple’s “help”, my computer had to wiped and started from new. Backup your contacts before you do anything!!! Do two backups: 1st – Address Book/File/Export/Export vCard. 2nd – Address Book/FileExport/Contacts Archive. I am running Mountain Lion and an iPhone5. And it doesn’t tell you which are going to be merged. 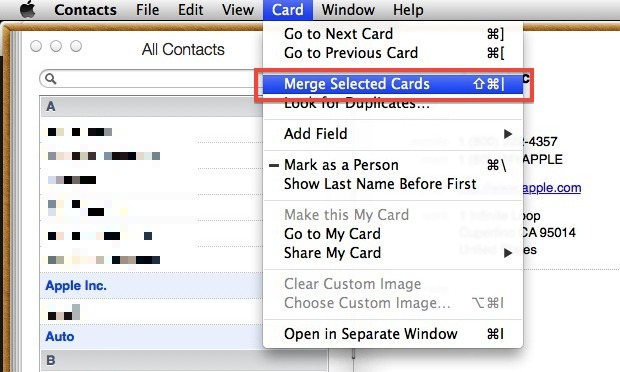 Later versions of OSX use function link contacts (Contacts\Cards\link), istead of merge. Merge seems to work for duplicates only. However, it doesnt seem to be permanent solution. Still, it does the job of cleaning up contact list.